Not only is coconut a lovely complement to the sweet corn but the thickness and creaminess of the coconut creamer makes it the perfect choice for this soup. With my new weapon in hand, I set out to recreate the soup I had over a decade ago. Kim’s secret is boiling the soup with the corn cobs to create a corn stock. It’s genius. For my first attempt, I made a corn stock separately and the soup a different day. I also did half coconut creamer and half coconut milk plus corn starch to thicken it. The second time I did it the way she used to, I boiled the corn cobs with the rest of the soup and used all cream. Both produced excellent results. Besides boiling the cobs and using the coconut creamer, the soup is very forgiving, there’s a lot of room for interpretation. Let me know in the comments if you tried something different and how it worked for you. Note: Like many soups, this one is best on the second day after all the flavors have developed. In a heavy soup pot, melt butter or heat olive oil. Add onions and garlic and saute for a few minutes. Add all peppers, cumin and salt, stir well and cook for a few minutes. 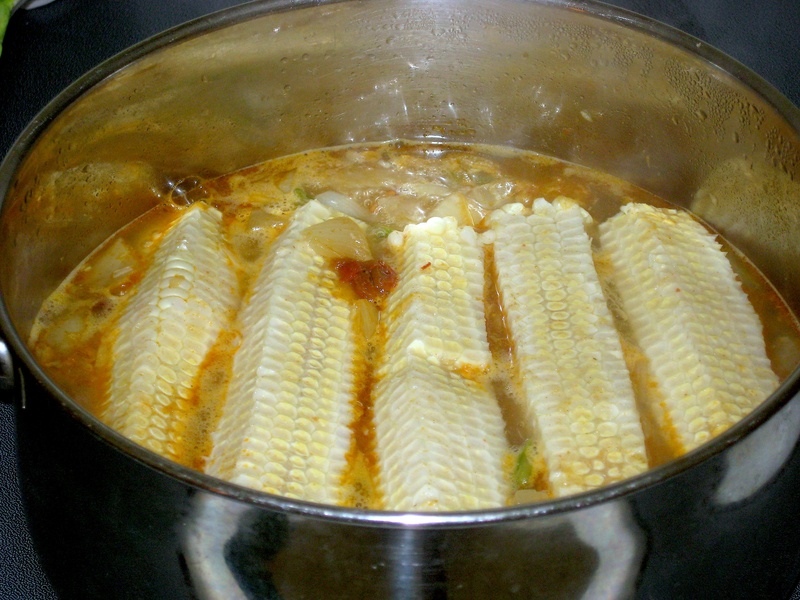 Add vegetable stock, fresh corn kernels and corn cobs and bring to a boil. Reduce heat to a simmer. Add potatoes. Cook until potatoes are fork tender. Remove cobs. Add 1 1/2 cups of creamer. Using an immersion blender or regular blender, puree half of the soup. Add back to pot and add frozen corn, thyme, oregano and remaining creamer (if necessary). Let cook for 5-10 more minutes. 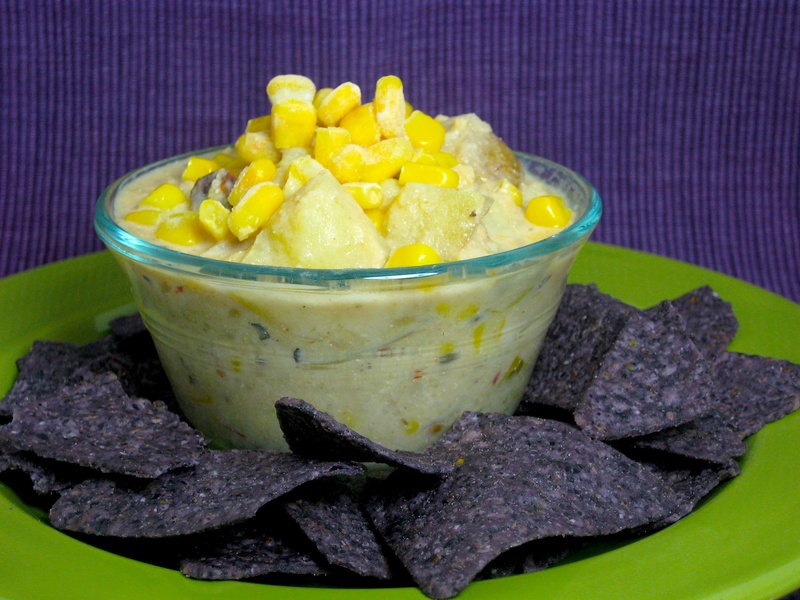 Remove from heat and enjoy with corn tortilla chips. For a spicier kick, add a dash of Aardvark hot sauce. YUM! 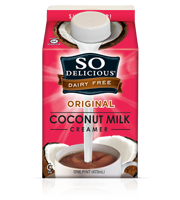 I’ve also been using So Delicious Coconut Milk Creamer in my creamy soup recipes. It really works great. Your Corn Chowder looks amazing, and I cannot wait to try it! BTW, I love the purple and green colors in the photo! They are the perfect backdrop to the golden soup and blue corn chips. I have mourned the loss of chowders since my son is allergic to dairy. Thanks for showing me a way to recreate them! Just wondering why you don’t use the kernels from the cob? Oh, I do! Was that not clear? I’ll reword it, thanks! Looks delish! So you use the kernels from the corn on the cob and frozen corn too? Just wanted to clarify before attempting to make. Angel, yes I use both. They provide a different flavor and texture I appreciate but you are welcome to use all one thing though I do recommend the cobs boiling to make a “corn stock”. Good luck and let me know if I can do anything else to help. I am out of coconut creamer, do you think I could substitute almond milk? I personally don’t like almond milk for savory preparations but if you like the flavor profile, by all means add whatever non-dairy milk you have around. You will likely need to thicken the chowder a bit if using milk instead of creamer. I recommend using cornstarch or arrowroot. Good luck!